There are more than enough things to consider when shopping for your next bathroom vanity - from the style to the finish to how it fits into your overall aesthetic. On the other hand, many companies have incorporated some unique features into their bathroom vanities that consumers should look out for. According to Trendir.com, the manufacturer DNA+ has recently released a bathroom vanity with a unique indentation next to the sink that is built right into the surface. This humble feature is an ideal place to hold soap, to place jewelry to the side while washing or to place any number of bathroom accessories. These unique features are another way that companies are helping consumers to cut down on clutter in their washrooms. In addition to this charming design feature, combining this contemporary piece with a sleek mirror or medicine cabinet could give a bathroom a refreshing makeover. 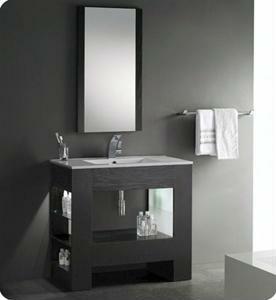 There are plenty of small advantages to look out for when shopping for a bathroom vanity. What accent will set your next purchase apart?